Office/Hours: PLC 471 on T/Th 2:00-3:00 p.m. Text: Frederic S. Mishkin, The Economics of Money, Banking, and Financial Markets, 8th edition (Addison Wesley: New York). Prerequisites: Economics 313 or the equivalent. Tests and Grading: There will be two midterms and a final. The midterms will be given on Tuesday, October 16th and Thursday, November 8th. The final will be given on Friday, December 7th from 8:00 a.m. – 10:00 a.m. Each midterm is worth 30% and the final is worth 40%. Grades will be assigned according to your relative standing in the class. Homework: Problem sets will be assigned periodically. These are not graded, but it is strongly recommended that you do them since exam questions will be based, in part, upon the problem sets. The Media Player and Google Video links go to new pages with embedded video players. The MPEG4 (QuickTime) and wmv (Windows Media Player) links are for downloads (right click). Note: Google Video has been a bit problematic at times, though it generally works fine, but the Media Player link should work if there is any trouble. If not, please let me know. Continue with materials posted for lecture 16. Conventional wisdom holds that when the unemployment rate falls below the NAIRU, wage inflation increases, which eventually feeds through to price inflation. A key question for policymakers is whether this conventional wisdom remains relevant today. There are a number of potentially mitigating factors that might temper the relevance of this historical relationship. Three factors that have received particular study of late are: (1) mismeasurement of available workers, (2) mismeasurement of the NAIRU, and (3) changes in the sensitivity of wage inflation to the unemployment rate owing to the rising importance and stability of inflation expectations. Although the measured unemployment rate is quite low, some would argue that it does not fully capture the population available for work. Relative to the late 1990s, the labor force participation rate (LFP) and the employment-to-population ratio remain low, suggesting that there is some room for the total workforce to expand. On the other hand, the aging of the baby boom makes the return to past peaks in LFP or the employment-to-population ratio less than certain. The NAIRU is difficult to measure and is affected by a number of demographic and institutional factors. There is a wide range of credible estimates of the current NAIRU—4.7 to 5.2—suggesting that labor markets may not be quite as tight as the consensus estimate would imply. The sensitivity of wage inflation to the unemployment rate depends in part on the inflation expectations of workers. Despite elevated levels of price inflation of late, inflation expectations remain well-contained, likely tempering the magnitude of cost-of-living based wage increases demanded by workers. Can an expansionary policy lead to a decline in aggregate output? Wake up to the dangers of a deepening crisis, by Lawrence Summers, Commentary, Financial Times: Three months ago it was reasonable to expect that the subprime credit crisis would ... not ... threaten ... economic growth. This is still a possible outcome but no longer the preponderant probability. Even if necessary changes in policy are implemented, the odds now favour a US recession that slows growth significantly on a global basis. Without stronger policy responses..., moreover, there is the risk that the adverse impacts will be felt for the rest of this decade and beyond. Headed For Another Game of Chicken?, by Tim Duy: Over the last two weeks, Fedspeak has been undeniably hawkish. Does anyone listen? As near as I can tell, pretty much no one in the global financial markets is listening. Expectations for additional easing in the months ahead are only growing. What’s a Fed watcher to do? Listen to the Fed or the financial markets? The smart money is on the markets and suggests the best move is to continue to shade expectations toward another rate cut in December. The FOMC perhaps could have waited for more clarity and left policy unchanged last week, but I believe that the potential costs of inaction outweighed the benefits, especially because, should the easing eventually appear to have been unnecessary, it could be removed. 1. Explain the Monetarist view of aggregate demand. Explain why Monetarists do not believe that shifts in the IS curve affect aggregate demand. 2. Explain the Keynesian view of aggregate demand. 3. Why does the short-run aggregate supply curve slope upward? What factors cause the aggregate supply curve to shift? 4. Is the economy self-correcting? 5. What causes the LRAS curve to shift, i.e. what factors affect the natural rate of output? Explain. 6. Do Monetarists agree with Friedman's contention that inflation is always and everywhere a monetary phenomenon? Explain using the AD-AS model. 7. Do Keynesians agree with Friedman's contention that inflation is always and everywhere a monetary phenomenon? Explain using the AD-AS model. 8. Explain how the pursuit of a high employment target by policymakers can lead to inflation. 9. Can budget deficits lead to inflation? Explain. 10. Why might governments choose to monetize the debt? 11. Explain the activist and non-activist positions on the use of government policy to stabilize macroeconomic variables such as real output. What problems are encountered in the pursuit of activist policies? 12. Explain and give an example of the Lucas critique. Why is this important? 13. What are the essential differences between the Classical, Keynesian, New Classical, and New Keynesian models? 14. Show that it is possible in a model with expectations (e.g. using the New Classical model) for an increase in the money supply to reduce output if the change in the money supply is smaller than expected. 15. Compare and contrast the effects of an unexpected increase or decrease in the money supply on prices and output in the traditional Keynesian, New Classical, and New Keynesian models. 16. Compare and contrast the effects of an expected increase or decrease in the money supply on prices and output in the traditional Keynesian, New Classical, and New Keynesian models. 17. Suppose the monetary authority wants to reduce the inflation rate. Compare the costs (in terms of output) of reducing inflation in the traditional Keynesian, New Classical, and New Keynesian models. Be sure to cover both an expected and an unexpected change in policy. Why is the credibility of policymakers important? How does inflationary policy arise? Fed Changes More Than the Number of Forecasts, by John M. Berry, Bloomberg: Federal Reserve officials are going public with lots of the details missing from their traditional bare-bones forecasts, and they're going to do it four times a year instead of two. The Federal Open Market Committee announced the changes yesterday in a statement, and Chairman Ben S. Bernanke discussed them in detail in a speech at the Cato Institute in Washington. One thing the changes won't include is a formal target for inflation. And all the added information being released won't necessarily provide better guidance about what policy makers will do with their overnight lending-rate target at the next FOMC meeting. Minutes of the meetings already provide significant information about participants' views on the short- term economic outlook and the balance of risks to growth and inflation. Will China soon be making not only cheaper, but also better, products than everyone else?, by Bruce Blonigen and Alyson C. Ma, Vox EU: The opening of China and its breathtaking ascendancy to major-player status in world markets has led to significant hand-wringing by the rest of the world on many fronts. The huge outflow of cheap unskilled-labour-intensive products from China and its ramifications for wages and welfare in both developed and other less-developed countries has been a primary concern. Recently, new hand-wringing concerns have been raised by various commentators. As it turns out, the composition of China’s exports is much closer to that of OECD countries than its level of per-capita income would suggest. This has substantial implications not only for China’s ability to sustain its growth, but also for real wages of all workers in developed countries, not just unskilled ones. A significant factor behind this surprising export sophistication by China may be the role of industrial policy to promote technologically-advanced industries. While it is well known that the Chinese government has historically had preferential tax treatment and free trade zones for foreign firms, it also often negotiates technology transfer arrangements with foreign firms. These are either through restrictions that limit FDI to joint venturing with a domestic partner or simply offering quid pro quo arrangements of technology transfer from the foreign firm to domestic ones in exchange for the foreign firm’s ability to sell to the huge Chinese market. Two types of risks are particularly important for understanding financial instability. The first is ... valuation risk: The market, realizing the complexity of a security or the opaqueness of its underlying creditworthiness, finds it has trouble assessing the value of the security. For example, ... during the turmoil of the past few months ... investors have struggled to understand how potential losses in subprime mortgages might filter through the layers of complexity that such products entail. The second type of risk that I consider central to the understanding of financial stability is what I call macroeconomic risk--that is, an increase in the probability that a financial disruption will cause significant deterioration in the real economy. Because economic downturns typically result in even greater uncertainty about asset values, such episodes may involve an adverse feedback loop whereby financial disruptions cause investment and consumer spending to decline, which, in turn, causes economic activity to contract. Such contraction then increases uncertainty about the value of assets, and, as a result, the financial disruption worsens. In turn, this development causes economic activity to contract further in a perverse cycle. So what is the Fed to do? "Free is More Complicated Than You'd Think"
The Federal Reserve Open Market Committee decided to cut the federal funds rate to 4.50%. The decision was not unanimous with Kansas City Fed president Thomas Hoenig preferring no change. Thus, the vote was 9-1 (the committee currently has two positions unfilled). Also, only six banks submitted requests to lower the discount rate. It's clear from the statement that the Committee does not want to set up expectations of further cuts with the fairly direct statement that "after this action, the upside risks to inflation roughly balance the downside risks to growth." 21. 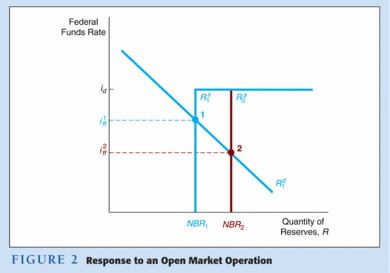 Use the supply and demand model for bank reserves to explain and illustrate the effects of (a) an open market operation to buy bonds, (b) a decrease in the discount rate, and (c) an increase in required reserves. 22. Describe the three tools available to the Fed for controlling the money supply. How do defensive and dynamic open-market operations differ? How do primary, seasonal, and secondary credit differ? What are the advantages of open-market operations relative to the other tools? 23. What is meant by the phrase lender of last resort? Why is this important? 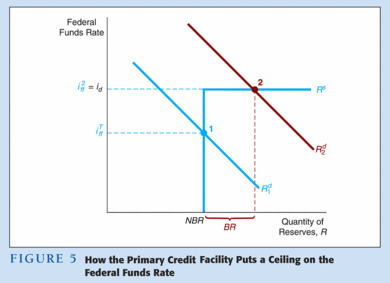 Explain and show graphically how the Fed uses discount rate policy to act as a lender of last resort and how this serves to limit the amount the federal funds rate can rise. 1. Explain the quantity theory of money. Explain the Cambridge approach and illustrate that it leads to the same identity as the quantity theory. What assumptions are imposed to arrive at a theoretical statement? 2. Is velocity a constant in Keynes liquidity preference theory? When actual data is examined, does velocity appear to be a constant? Why is this important? 3. What is the money demand function in the classical model? 4. Discuss the transactions, precautionary, and speculative motives for holding money in Keynes liquidity preference theory. When all three motives are put together, what theory of money demand emerges? 5. Show the money demand curve graphically and explain why it slopes downward. Show how the money demand curve shifts when income increases. 6. According to Baumol, the transactions demand for money depends upon the interest rate as well as nominal income. Explain why the transactions demand for money depends upon the interest rate. Why is this important? 7. What did Tobin add to Keynes theory of the speculative demand for money? Why was this development important? 8. Explain Friedman's Modern Quantity Theory of the Demand for Money. 9. What is the 45 degree line diagram? What is the expenditure multiplier? What is the slope of the expenditure function? What factors cause the expenditure function to shift? 10. Derive the IS curve. Explain intuitively why it slopes downward. What factors cause the IS curve to shift? In what direction do they shift the IS curve? 11. Derive the LM curve. Explain intuitively why it slopes upward. What factors cause the LM curve to shift? In what direction do they shift the LM curve? 12. Is the equilibrium in the IS-LM model stable? Explain. 13. Show graphically and explain intuitively how an increase in government spending affects income and the interest rate in the IS-LM model. 14. Show graphically and explain intuitively how an increase in the money supply affects income and the interest rate in the IS-LM model. 15. Explain why the LM curve is vertical when money demand is unaffected by changes in the interest rate (as in the classical model). 16. Use the IS-LM model to show that monetary policy becomes more effective relative to fiscal policy as money demand becomes less sensitive to the interest rate. Explain the result intuitively. 17. Explain why investment is less sensitive to interest rate changes in recessions as compared to when the economy is operating closer to full employment. Explain why the IS curve is vertical when investment is completely insensitive to changes in the interest rate. 18. Use the IS-LM model to show that fiscal policy becomes more effective relative to monetary policy as investment becomes less sensitive to the interest rate. Explain the result intuitively. What does this imply about the use of monetary and fiscal policy over the business cycle? 19. Show that the Fed cannot continuously hit both a money supply target and an interest rate target, i.e. that it must choose one or the other. 21. Do changes in the money supply and government spending affect output in the long-run? Explain using the IS-LM model. 22. Derive the aggregate demand curve from the IS-LM model and explain intuitively why it slopes downward. What factors cause the AD curve to shift? In what direction do they shift the AD curve? And So It Begins, by Tim Duy: The Fed begins a two-day meeting today, with market participants widely expecting a rate cut. I am mentally prepared to be on the wrong side of this call, joining the lonely few, but I just can’t tease another rate cut out of the incoming data. Runaway Rate Cut Train?, by Tim Duy: I agonize over this stuff. Constantly. And it is not really part of my job. Just can’t get it out of my mind. To me, the uncertainties about how financial conditions might evolve and affect the real economy mean that risk management considerations have an important role in the current policy environment…However, there is a less benign possibility. Housing demand and prices could weaken a good deal more than we expect — either because a new shock hits the sector or because we have underestimated the weakness already in train…. I want to emphasize that I do not see this extreme outcome as likely. But it is one of those high cost outcomes that we should guard against. The challenge is to calibrate the insurance in light of the lower probability of the spillover event occurring. The upshot of such speeches has been to entrench expectations that as long as housing is deteriorating, the downside risks to the economy are too great to be ignored, and therefore rate cuts will continue regardless of the relatively minimal impact the housing downturn has had on the rest of the economy. Still unsteady credit markets argue further for additional cutting. Monetary Policy under Uncertainty, by Ben Bernanke: Bill Poole's career in the Federal Reserve System spans two decades separated by a quarter of a century. From 1964 to 1974 Bill was an economist on the staff of the Board's Division of Research and Statistics. He then left to join the economics faculty at Brown University, where he stayed for nearly twenty-five years. Bill rejoined the Fed in 1998 as president of the Federal Reserve Bank of St. Louis, so he is now approaching the completion of his second decade in the System. Fed Policy and Moral Hazard, by Harvey Rosenblum, WSJ: Accusations of moral hazard have been tossed around quite a bit since the Federal Reserve lowered the federal-funds rate by half a percentage point a month ago today. Moral hazard, if you're neither an actuary nor a practitioner of the "dismal science," occurs when investors or property owners are protected from the downside risks of bad investment decisions, thus encouraging them to take still more unwise risks in the future. As entertaining as this discussion of the nexus between the Federal Reserve and moral hazard has been, the analysis is incomplete because it lacks one key element -- something called the Taylor Rule. The namesake of this bit of economic wisdom is John Taylor, perhaps the best scholar on monetary policy in our times. His rule, a description of monetary policy decision-making formulated a decade and a half ago, has a good deal of relevance to any discussion of Fed policy and moral hazard. So what exactly is Taylor's Rule? Put simply, it prescribes higher interest rates when inflation crosses certain thresholds and the economy is near full employment; and lower rates when the opposite is true. When these goals are in conflict the Rule provides guidance on how to adjust rates accordingly. But before we get to why Mr. Taylor's work matters, we've got to better understand moral hazard, which, as Mr. Bernanke defined it in a textbook he coauthored, is "the tendency of people to expend less effort protecting those goods that are insured against theft and damage." Why has moral hazard reared its head after the Federal Open Market Committee cut interest rates at a time of turmoil and uncertainty in financial markets? These are homework/review questions for the first exam which will be on Tuesday, October 16. The list is extensive - it covers all the topics we have covered or will cover in class. A thorough understanding of these questions is a good study guide for the exam. 2. To be useful as a medium of exchange, what properties should money have? 3. Describe the evolution of money from barter to fiat money. How did paper money arise? 4. How is money measured? Why is there more than one definition of the money supply? Are data on the money supply reliable? 5. How do nominal interest rates, ex-ante real interest rates, and ex-post real interest rates differ? Of the two real rates, which is the most important for understanding economic decisions? 6. Briefly describe the major functions of Federal Reserve district banks. 7. How do member banks differ from other banks? How did the difference change in 1980? 8. Who is on the FOMC? What does the FOMC do? 9. Describe the structure of Federal Reserve districts and Federal Reserve banks. 10. Describe the structure and function of the Board of Governors of the Federal Reserve System. 11. How has the power structure of the Federal Reserve System shifted over time? 12. How independent is the Fed? What factors contribute to independence? What factors work against independence? Discuss arguments for and against the independence of the Fed. 13. Write down the government budget constraint and explain each term. 14. Use t-accounts to show that the Fed can control the monetary base better than it can control either currency or reserves. What does this result tell us? 15. Suppose that a bank has $100,000 in excess reserves that it loans out. Assuming that the required reserve ratio is 20%, use t-accounts to illustrate the multiple deposit creation process. Use this to obtain the simple deposit multiplier. 16. Suppose that the required reserve ratio is 20%, and the monetary base is 1,000. (a) Find the money supply. (b) Let open market operations increase the monetary base by 200. Use the money multiplier to find the new value of the money supply. 17. Explain why the multiplier falls when people hold currency or when banks hold excess reserves. 18. Suppose that the required reserve ratio is 20%, the currency to deposit ratio is .25, the excess reserve to deposit ratio is .05, and the monetary base is 1,000. (a) Find the money supply. (b) Let open market operations increase the monetary base by 200. Use the money multiplier to find the new value of the money supply. 19. Explain how and why the money multiplier changes when (a) the required reserve ratio increases, (b) the currency to demand deposit ratio increases, and (c) the excess reserve to demand deposit ratio increases. Who determines each of these quantities? 20. (a) Explain why the demand curve for reserves slopes downward. 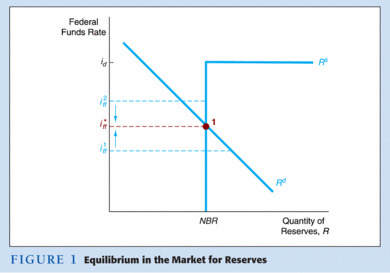 (b) Explain the shape of the supply curve for reserves. [Update: Exam ends here, i.e. it covers questions 1-20]. This is a very nice summary of how economists measure the economy's maximum sustainable level of output from Mishkin. The term "maximum sustainable level of output" is a better description of what we are trying to measure than the more common terms such "potential output" or "full employment." Let me try an example to illustrate. For a graduate student, over the course of an entire quarter, there is a certain maximum sustainable level of effort. It might be, say, 14 hours of class and study per day on average. That is "full employment" or "potential output." But in the short-run it's possible to exceed that level of output. Right before a test students can work 20+ hours a day, more than full employment, but such a level of output is not sustainable over the longer run. People need a minimum level of sleep, time to eat, etc. So, potential output for students is the level of effort that is sustainable day after day after day, not the most that can be accomplished in a given 24 hour time period. A business can do the same thing. If it has 10% of its trucks off the road for maintenance at any given time (i.e. "sleeping"), it can keep those on the road when demand is really high to deliver a little extra, keep workers overtime, run the production lines 24 hours a day without maintenance, etc. But that kind of effort, though possible in short bursts, is not sustainable over the longer haul (with the existing level of resources). Trucks and production lines have to be taken down for maintenance every so often or there will be big problems down the road, people won't work long days continuously, etc. Here, too, when we talk about potential output we don't mean how much the economy can produce in the short-run when it's overheated (sort of like just before an exam), but rather what it can do on a sustainable basis over time with a given quantity of inputs. More formally, then, we can define potential output as the level of output the economy would produce if labor and all other resources are fully and efficiently employed, where full employment means the maximum sustainable level of activity. How Independent is the Fed? This has changed with the adoption of inflation targeting by central banks. Note also that Adam Posen casts doubt on whether causality runs from central bank independence to improved macroeconomic performance in Central Bank Independence and Disinflationary Credibility: A Missing Link?, NY Fed Staff Report, May 1995. This is an area you can edit as you wish [edit password=lecture4]. Financial Globalization's New Power Source, by David Wessel, WSJ: In the blizzard of headlines about borrowing by private-equity firms, rising oil prices and accumulating hoards of cash at Asian central banks, it's hard to tell if this is part of the same old story of money sloshing around the globe, or if something big is happening. Pension funds, mutual funds and insurers still hold a bigger chunk of the world's financial assets ($59.4 trillion) than more recent pools of capital. But four newcomers are gaining rapidly: Asian central banks, hedge funds, private-equity funds and petrodollar investors, the ones pocketing the proceeds from $80-a-barrel oil. Together the four hold $8.4 trillion, excluding overlap, roughly $1 of every $20 in the global financial system. Their assets have tripled since 2000. Even if oil prices fall back to $50 a barrel, China's giant trade surplus shrinks and growth in private-equity and hedge funds slows, McKinsey Global Institute, the think-tank arm of the big consulting firm, projects the assets of these Big Four will double by 2012. Their rise amounts to a new phase in the globalization of financial markets. They are one important way in which economic earthquakes spread from one country to another. Europe's economy is shuddering not because the U.S. is importing fewer Mercedes or bottles of French wine, but because financial shock waves from defaults on subprime mortgages in Detroit are jolting banks in Düsseldorf. "The new power brokers represent a structural shift in global capital markets," McKinsey says in a 174-page analysis out today. Their growth, the analysts add, is "mutually reinforcing" as oil barons put their petrodollars in hedge funds, and so on. This is an area you can edit as you wish [edit password=lecture3]. Dual Banking in the U.S. The Evolution of Central Banking in the U.S.
Should the Fed Focus on Core or Headline Inflation? Which Measure of Inflation is Best for Monetary Policy? This is an area you can edit as you wish [edit password=lecture2]. Greenspan says inflation will accelerate in the next twenty five years, but does ne make persuasive case? Greenspan Says 'Pending Tsunami' May Hurt Fed, by John M. Berry, Bloomberg: In the final chapter of his book, ''The Age of Turbulence,'' Alan Greenspan lays out what he sees for the next quarter-century: falling world saving, rising inflation, higher interest rates and extreme political pressure on the Fed to let 'er rip. His scenario isn't impossible. However, he doesn't really build a convincing case for it. Some of the reasons cited by Greenspan for his concern -- such as the potential for greatly increased federal government spending as the Baby Boom generation retires -- are certainly valid. Why Study Money and Monetary Policy? This is an area you can edit as you wish [edit password=lecture1]. "Which Institutions Matter for Economic Growth?" "Does a Downward-Sloping Yield Curve Predict a Recession?" "Economists and Other Humans Don’t Always See Eye to Eye"
We will begin these next lecture. Atlanta Fed: Mortgage Innovation Boosted Home Ownership: After holding steady for three decades, the share of U.S. households owning their own home jumped from 64% in 1994 to 69% in 2005. The primary cause, argues a new staff study from the Federal Reserve Bank of Atlanta, was the introduction of new mortgage products that reduced the initial down payment needed by a home buyer. The paper, by Matthew Chambers, Carlos Garriga, and Don E. Schlagenhauf, examines changes in home ownership by age cohort. The U.S. population aged in the last decade, boosting the share of the population in age cohorts that are more likely to own a home. But the authors conclude this explains just 16% to 31% of the rise in total home ownership. The introduction of new mortgage products, in particular those that allowed little or no down payment, accounts for 56% to 70% of the increase. Such loans tend to be the contract of choice for younger cohorts which explains an important part of the increase in the aggregate homeownership rate observed since 1994, they say. Indeed, while the homeownership rate rose for all age groups in that period, it rose most for households under age 35: it jumped to 43% from 37.3%.